Fiat grabbed all the headlines a few days ago when the Italian group said it would take full control of Chrysler. The move was widely expected, but it still raised many questions. Sergio Marchionne answered most of them in a interview to La Repubblica, the leading Italian daily. M.Marchionne first says he will form a new holding company to run the group, but he doesn’t say where it will be headquartered. Only that he’s ready to go anywhere to find investors, up to Hong Kong, and that it’s easier to find in New York than in Turin. That alone explains the need for a new name, since Fiat means Fabbrica Italiana di Automobili – Torino. M.Marchionne then dismisses the idea of a capital hike, for the very simple reason that it hurts the existing capital (and its owners), but besides the financial news, there were also surprises on the product side. Bad news first, Lancia will disappear. This prestigious Italian brand has a long and famous history, but after many years of decline, the Lancia badge will be for the Italian market only, with a single model, the smallest one, the Ypsilon. Lancia cars were supposed to be Fiats with more style and equipment, but there will be less in need as Fiat cars will move upmarket. Forget the cheap little Fiats of the past. Fiat will now focus on premium models, where the margins are higher, and it will keep only two product lines, the 500 and the Panda. Alfa Romeo will be resurrected with better and more original products, and its cars won’t share their engines with Fiat anymore. Alfa Romeo will move closer to Maserati, selling only great cars like the stunning 4C sports car, Marchionne will tell more about it this Spring. Enthusiasts will cheer, but there’s one little thing annoying for greenies: the total absence of any plan regarding EVs or hybrids. Sure, there’s the Fiat 500e, but it’s limited volume and only available in California. It’s a Fiat that Italians can’t buy, and there are no known plans to change that, nor to bring another electric model to the European markets. The Fiat-Chrysler group is enjoying record sales for Jeep (730,000 last year), with large displacement SUVs, and it seems it hasn’t seen the need for greener cars. Or could Jeep unveil a hybrid concept in Detroit? Let’s hope it will. 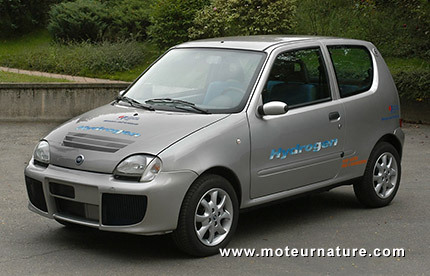 Our illustration shows the prototype of an electric Fiat Seicento with a fuel cell.